SGC Offworld Team Patches - Discounted Jacket puchase set. Set of 3 jacket patches of your choice. Choose team SG2 - SG25, Branch of service patch (USAF, US Navy, Marines, etc.) 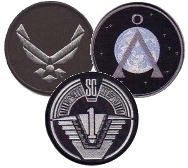 and the standard SG Project (Earth Chevron) patch.Set of 3 jacket patches of your choice. Choose team SG2 - SG25, Branch of service patch (USAF, US Navy, Marines, etc.) and the standard SG Project (Earth Chevron) patch. Set of 3 Embroidered SGC Offworld Team patches WITH velcro attached. This set of 3 patches are offered at a discounted amount WITH PURCHASE of an OD GREEN OFFWORLD JACKET ONLY. Please do not order this patch set unless you are ordering an OD OffWorld Jacket! 3) USAF (A51/AP) Branch Service patch. If you require different team or Service Branch patches, please include a note with your order letting us know which patches you require. Patches are available in Team SG1 Through SG25, SG Delta, SG Special Forces and SG Special Operations Command. Factory standard glue backing with hook side velcro sewn to patches. Most patch styles are in stock. Please allow 5 to 10 business days for shipping. For out of stock items, please allow up to ten additional business days for delivery. Patch image is for illustration purposes only! Actual patch sizes are correct and are not identical to each other as in the image! Copyright © Alchemy Arms. All Rights Reserved.